To help give back to the real estate community, we decided to research and write this free guide to internet marketing. If you have any questions, feedback, or comments we would love to to hear from you. Thank you for reading and I hope this guide helps you grow your business! Domain names are the foundation upon which all web based businesses are built. Think of your domain name as virtual real estate with relatively high up front costs and negligible maintenance costs. Some real estate agents, proud of their personal brand, chose to register a domain name like BradleySmith.com or BradleyJohnsonRealty.com. The big issue with such a decision is what happens if you want to sell your business, or what happens if you die? The multiple such a business could sell for is less than what a strong business built on a generic domain name would go for. The one significant benefit of a personalized domain name is that if you later decide to move you can take your business with you, but you do not need to put your personal name in the domain name - if you have a quality website that is well cited amongst other webmasters then you should be able to rank for your name even if you are on a generic descriptive domain name. But many real estate professionals who operate in multiple regions chose to register a relevant domain name for each market to ensure their marketing is as relevant and profitable as possible. Relevancy is a key to search engine marketing - which we will discuss later on in this article. Most real estate searches are location specific. A domain name like AtlantaRealEstate.com is easy for consumers to remember. If you buy a strong domain name, any other online or offline marketing you do benefits from the memorability of your strong domain name. From a search perspective your domain name plays a big role in both PPC listings & organic search results. PPC listings: if your domain name is AtlantaRealEstate.com then searchers looking for Atlanta real estate are more likely to click on your listing than competing listings. This boost in clickthrough rate means that search engines like Google generate more revenue when they show your ad, so they give you a discount for your ad relevancy. Link anchor text: People tend to reference things by their official names. If your official business name and domain name are AtlantaRealEstate.com then many people who link at your site will be likely to use Atlanta Real Estate in the link anchor text. Getting relevant link text in inbound links helps boost your relevancy for that phrase and some closely related keywords. Exact match benefit: If your domain name exactly matches a keyword phrase then search engines like Google and Microsoft Live may give you an additional relevancy boost for the keyword phrase that makes up your domain name. All other things being equal, AtlantaRealEstate.com will outrank BradleySmithRealty.com for a search on Atlanta Real Estate. If you operate in a country other than the United States it may be beneficial to buy a domain name that matches your local extension and host your site locally. A real estate agent in the UK would benefit from owning a .co.uk domain name and hosting their website on a UK host. Do not use an irrelevant local extension. It is best not to build a US or UK real estate site on a .in domain name (the TLD for India). Localized relevancy algorithms and/or editors working at search companies may not view a foreign domain name as relevant. Within the US both the .net and .org names are considered acceptable alternatives to the .com, though they are slightly less memorable. If you aggressively market a .org or .net domain name offline then some of the prospects will likely end up at the associated .com domain name. Some generic descriptive domain names may still be available, but most of the best names are already registered. If all the domains you like are already purchased then you may be able to buy them direct from the owner or via services like BuyDomains, Fabulous Domains, & SEDO. Some new general TLDs like .xyz and .top are popular in China, however many new extensions have a high likelihood of either disappearing or sharply increasing registration price. It is probably best to go with one of the safe legacy domain extensions like .com, .net or .org. The National Association of Realtors offers members access to the .realtor TLD. Due to their deep industry influence it is much more likely to be stable than most new domain extensions. The annual cost of these domains is $39.95 for individual Realtors, $79 for firms & $99 for boards. They also provide bulk pricing discounts for companies purchasing 10 or more domain names. One thing to note is if you ever change careers you may not be able to keep a domain name which was built on the .Realtor extension. When you set up your website you should align your site structure against keywords. For example, if you sell condos, town homes, undeveloped lots, and mansions you would not want to send all those visitors to the same page. One page should focus on undeveloped land while the next page focuses on town homes, etc. Create a small list of things you would expect consumers to search for. Use an Excel spreadsheet to keep them organized by topic, and associate each relevant cluster of keywords with a page on your website or a section of your website that can be broken down into a variety of relevant pages. within the theme of Atlanta real estate, there are many neighborhoods that might be worth targeting - Buckhead, East Atlanta, etc. Use keyword tools, competitive research tools, analytics data, and client interactions to help expand your keyword lists. Google AdWords Keyword Suggestion Tool - Google's basic keyword tool which generates a list of keywords from a smaller keyword list or URL. Google Traffic Estimator - shows ad click price & volume estimates based on broad match, phrase match, & exact match versions of keywords. Bing Keyword Research - requires a Microsoft account. Wordtracker Free Keywords - the free version of Wordtracker's keyword tool. Wordtracker has much less data than Google, but was one of the original keyword tools and remains one of the best tools on the market. 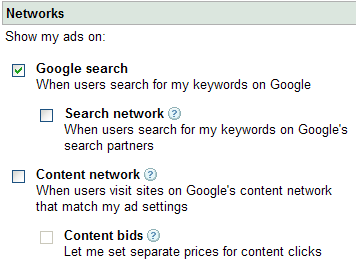 Please note that Google now requires marketers & researchers to open an AdWords advertising account to see keyword data. Some affordable competitive research tools like SEMrush and Spyfu allow you to see what keywords drive traffic to competing websites. You can also find related sorting mechanisms and keyword modifiers by looking at the navigational options within larger real estate sites like Trulia and Zillow. For many locally oriented real estate searches there are so few searches that keyword tools do not accurately predict search volume. 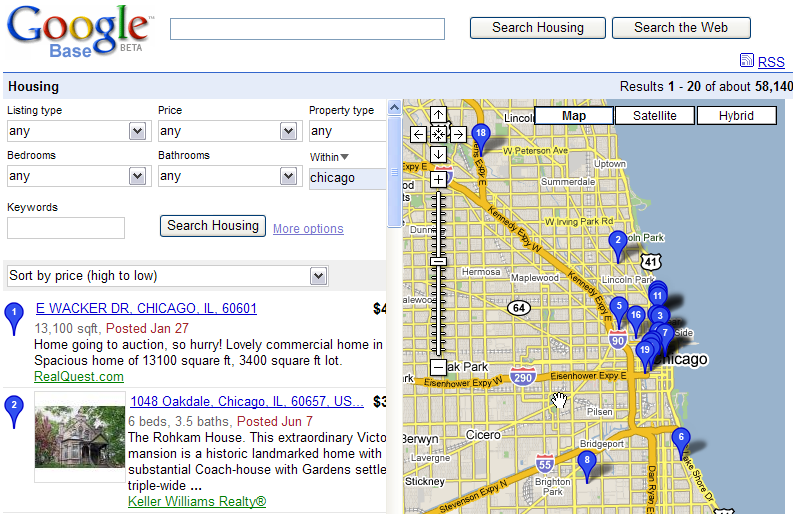 In these sorts of cases you can look at search volumes for related nearby larger cities to discover the general trends. If you did not find much search volume for Decatur, GA you could look at popular Atlanta related keywords, get a list of good keywords, and then replace Atlanta with Decatur. This strategy will not create new search volume, but will help ensure you have a deep focused keyword list even when there is not much keyword data available. This search result shows where pay per click ads and the natural / organic search results appear on the search engine results page. Please note that the number of ads shown at the top of search results depends largely upon ad relevancy and consumer clickthrough rates. If the ads do not generate a high clickthrough rate then Google only shows ads in the right rail of the search results. About 15% of Google's clicks are on ads while about 85% of clicks are on the organic search results. 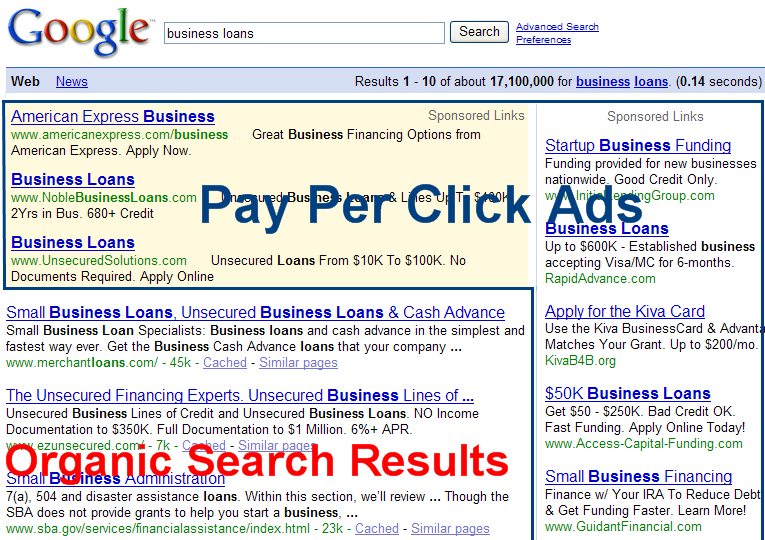 For other search engines the click ratio is closer to 30% on ads with about 70% on the natural / organic search results. The above screenshot is a number of years old. The shading which formerly appeared in the background of search ads typically no longer appears & instead there is a small "ad" label. Search engines have also diminished the reach of organic search results by increasing the size & number of ads which show in the search results. Google may show up to 4 ads above the organic search results, while Bing & Yahoo! may show 5 ads at the top of the page. It can take many months to rank well in the organic search results. Many real estate professionals chose to use pay per click programs like Google AdWords and Bing Ads to help get their websites instant exposure and market feedback. These programs charge you for every click, but allow you to start testing your marketing as soon as your site is ready. If you are new to pay per click marketing your best bet is to start with Google AdWords since they have the most market share. Track your results and find out what is working well for you, then carry that data over to your Yahoo! and Microsoft campaigns. When setting up you first Google campaign you probably want to opt out of search syndication and content syndication until after you get a feel for how pay per click advertising works. Within your edit campaign settings page you would want to ensure the Google search box is checked and the following 3 are not checked, as shown in the picture below. You can use a keyword list generator to cross reference locations and keyword themes to set up your ad groups. Keep in mind the above tip about ensuring that you send visitors to the most relevant landing page possible. If you are fairly certain with your keyword data you probably want to use a combination of exact match and phrase match to market your website. If you are uncertain if there are many additional relevant keywords and searchers that you may not be reaching, then you may want to use broad match and use analytics to find additional relevant keywords. Google discusses the major keyword match types here. In addition to using locations as a keyword modifier you can also use Geo-targeting, but most real estate searches tend to have local modifiers in them. If conversion is an offline event then you can set up a specific phone number to track calls from your website, or use online interactions as a proxy for estimating offline value. If conversion is an online event (or there is an online step associated with conversion - like filling out a lead form) then you can assign an average value to the conversion or conversion step and base your click prices on that information. For example, if 1 in 20 customers fill out a lead generation form, and each lead generation form is worth $100 to you then you can afford to pay $5.00 per click at your break even point. If you are struggling to measure conversions and are in need for a proxy to estimate visitor value you can create a local real estate guide PDF - with information on crime rates, schools, best neighborhoods, etc. and give it away to prospects in exchange for their email address and phone number. Install the analytics code on the thank you page to track conversions. Ensure the PDF reminds them to contact you if they have any questions or need help, and follow up on leads asking if they need help if you are hungry for business. Invariably some keywords will perform well and others will perform poorly. If you find that some keywords are particularly effective you may want to increase your bids on them and/or focus your organic search optimization strategy (discussed below) around them. If you find keywords that perform exceptionally poor then you may want to remove them from your PPC campaigns and/or add negative keywords which prevent those prospects from seeing your ads. Some leads are worse than worthless because they eat up your time and have no practical value. If you sell mansions and keep getting contacted by people looking to rent apartments then look at your keyword list AND your website. If your keywords and content are focused on the best leads you should not get much noise. Conversely, if you are getting a lot of noise it may mean that your content is not resonating as well as it should with your target customers. Your page title, meta description tag, and filenames appear in the search results when your pages rank. If any of these contain your keywords in them then they will be bolded in the search results, which helps your listing stand out and helps draw clicks to your website. Google shows ~ 65 characters from your page title in the search results. Keywords near the beginning of the page title are given more weight than keywords near the end of the page title. Since this is the link people click before visiting your site Google places a lot of algorithmic weight on it. Make sure each page title on your site is relevant to that specific page. Google shows ~ 160 characters from your meta description in the search results. Meta descriptions are not given much algorithmic weight from most search engines, but relevant meta descriptions can help pull in more clicks. If you create meta description tags make sure they are relevant on a per page basis. If you do not have a meta description Google will automatically generate one based on snippets of text from your page. Separate keywords in your filenames with a hyphen (-) as opposed to an underscore (_) or a space. The hyphen is easier to see in the address bar. It is best to minimize redundancy in the file names and folder paths. Flash: some websites are made entirely out of Flash, but since Flash offers search engines little to no textual content these sites struggle to rank well in Google for a broad array of relevant keywords. If you must use Flash, consider embedding the Flash files in a standard HTML files and offering static HTML text links to the important pages on your site. Frames: some websites uses frames to display their content, but since frames make it hard for users to know what page of the site they are on it is hard for people to deep link at featured content or share pages with friends and family. Worse yet, if and when search engines index framed websites, they may list individual frames outside of the frameset, so searchers might only find a broken piece of the framed website! CSS and modular includes or the use of content management systems like Wordpress are preferable to placing a website in frames. * Please note that embedding an iframe in a page is fine, but placing all of your contents in frames is not good for users or search engines. Once you have a list of keywords mapped out against how you want to structure your site, you should make sure each page is focused on a close group of related keywords. In the late 1990's simply repeating your keyword again and again was considered optimization, however, the search relevancy algorithms have evolved and such rouge repetition is not an effective marketing strategy. Instead of repeating a keyword over and over it is best to write natural, with the intent of writing content that will help drive conversions. It also helps to mix up your word usage so you capture a wider net of related keywords. If your page title uses Atlanta, GA then try to use an alternate version like Atlanta, Georgia in the page copy. Use both versions and mix them up, but try to make it sound natural. 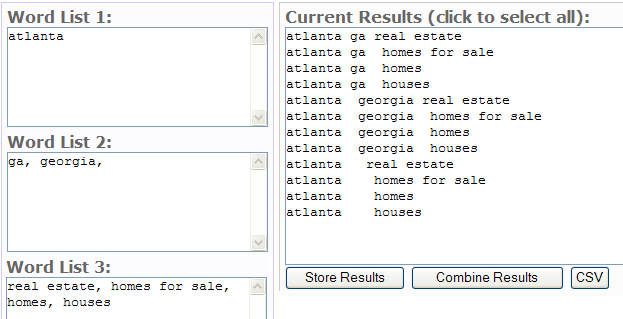 If your target keyword is Atlanta real estate and you find that it is used many times in the page copy try to switch some of them with keywords using alternate word orders like real estate in Atlanta. In some cases keywords overlap. 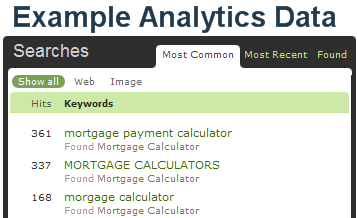 If your page is well optimized for mortgage calculator then it is not hard to optimize the page for free mortgage calculator or online mortgage calculator by simply adding the words free and online to the page copy somewhere. Each page should have relevant keywords associated with it, but you do not want to focus every page of your site on the exact same keyword phrase. Your homepage typically targets your most competitive and broad phrase, while interior pages are focused on other less competitive and more niche phrases. For example, if your home page was focused on Atlanta Real Estate then you might have an internal page focused on Atlanta Condos. Make each page as long as it needs to be to effectively communicate your message. There is no universal exact number of words that each page should be. Some pages that are featured content should be many hundreds or thousands of words. Pages that are administrative, like a contact us page, are generally expected to be short. Online people are used to things being easy. Rather than relying on your sitewide navigation, it is better to actively link to your conversion oriented goals from within your website's content. If you are in a small town it may not be hard to rank well by just doing the basics, but in larger cities there is much more competition. While many websites will try to rank for a keyword like [San Francisco real estate] only a few sites will rank well for that type of keyword & the sites which rank well are likely to be well-know real estate portals like Zillow, Trulia & Realtor.com along with long established brokerages. If your site offers something useful which people actively seek out & reference then it will be far easier to compete against people who are only concerned with trying to rank for the core industry terms without offering anything unique. Sites which capture relevant audiences early in the discovery funnel can leverage ad remarketing features to market related commiercial offers. Most websites are of low quality, and thus any website that nobody links to is hard to trust. Search engines follow people, and search engines trust the content that other people trust. Links are seen as a sign of trust and a vote for the quality of the site being linked at. If nobody is voting for your site then it is going to be hard to outrank other established sites that have many people linking at them. Armed with the above information, in years past many real estate agents engaged in massive link trades with other real estate agents. That worked for a few years until Google killed it in early 2007 by penalizing many real estate websites. If a site is well linked to from many other trusted sites it acquires a lot of trust it can pass onto other sites. Sites that have few trusted inbound links can not pass much trust onto other sites. You can view the PageRank of a page by installing the Google Toolbar. Many webmasters began buying and selling links based on the PageRank score, so Google only updates the toolbar display PageRank about once every 3 months. If a link is near many other paid links then odds are that Google does not count it in their relevancy scores. If a link is sold specifically based on the PageRank score then that is not a link Google wants to trust. If a paid link only comes as a side effect of a business transaction then Google probably wants to count it. Note: this guide was published many years ago. Since then Google has removed PageRank from their toolbar, but they still use the data internally for crawl prioritization, content de-duplication & ranking. BOTW - a general directory that is a bit smaller than Yahoo! and DMOZ, but still has decent exposure across the web. JoeAnt - a directory which was formed by former Go.com directory editors. Business.com - a well known business focused directory. Some directories require a reciprocal link to list your site. Generally most of the directories that do that are not worth submitting to because they require you to link to them from your homepage and they link to you from some page which gets little traffic and has limited link authority. Many directories are set up to sell PageRank but have little to no editorial guidelines. Some of them may pass link trust for a limited period of time until Google finds them and stops counting those link sources. Google tends to clean up directories in waves, and did 3 or 4 major clean ups in 2007. There is also a list of niche real estate directories of varying quality at overlyreal.com/directories/ While most of those may not pass link trust a few of them may count, but time spent hunting out hundreds of directories to submit to would likely be better spent creating market leading content and building links from trusted websites. Chamber of commerce (make sure they provide a permanent link to members, and that Google indexes the members page). Active Rain is a popular real estate community that allows you to create a member blog and communicate with other real estate professionals. There are many other real estate forums and communities that are easily accessible from a Google search. If you write a guest column for a popular blog or other website related to your location, trade, background, hobbies, etc. you can reference your site in the author byline. Network & speak at industry gatherings. Ask friends for links. If some of your friends have websites they may be willing to mention your site free of charge. If you have the opportunity to help guide or control the anchor text of inbound links you should use your keywords. If another site links to my site with Atlanta Real Estate in the anchor text that helps Google know that my site is about Atlanta Real Estate. While you can not control how everyone links to your site, you can make it easy for them to link to you the way you want to by using your keywords in your domain name and page titles. Since you control your own website you can ensure that your internal links contain descriptive keywords that are relevant to the destination page. A rookie SEO mistake is to try to funnel all traffic and all links to the homepage. But if your homepage is commercially focused there is some finite limit to how many links you will be able to build for it. You can build many additional links by looking for holes in the market and creating content around linking opportunities. If people link to an article on your website then that trust and link equity flows through the rest of your site and helps all of the other pages on your site rank better as well. When my husband was looking for a place for us he shopped on Craigslist. Many others likely do as well, especially for people who are looking to rent. Sites like Zillow and Trulia are also taking a large share of real estate specific traffic. 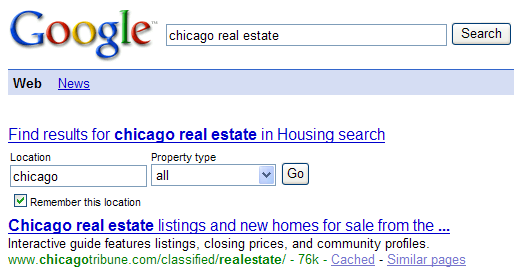 Google offered a Housing search option at the top of many organic search results, which tied into Google Maps and Google Base. This feature has since been discontinued, however given the size of the real estate market it would not be surprising to see Google re-enter the market. Google tested a mortgage market offering along with insurance-related ads under the Google Advisor name, however they shut down this service in favor of shifting from displaying 3 to 4 AdWords ads above the organic search results. While some real estate agents are busy hunting for directories and paid links that Google engineers are trying to kill you can enjoy the benefits of participating in conversations, building social relationships, and building links and citations that come as a side effect of those conversations and relationships. Thought leadership does not happen overnight, but is a process you build up to by connecting to your target audience. Depending on your marketing strategy you marketing audience may consist of people looking to buy or sell a home, real estate professionals, bloggers, and media members. Create local guides highlighting ideas like where crime is low, where the schools are best, traffic trends, and other things that may be of interest to home buyers. Offer home buyers tips on how to save big money on their home purchase. A single tip like paying their mortgage bi-weekly can save them $10,000's . Create local guides focused on entertainment and the history of your area to tap a wider audience than many competing sites will. As your link out to other real estate bloggers, reference some of their best posts, and interview some of them they might be willing to do the same in return. This strategy has the benefits of reciprocal links without the risks of the spammy reciprocal link networks. If you have many years of experience in the real estate field then offering tips that help other real estate professionals improve their businesses and/or quality of lives can help build links, credibility, authority, and even a bit of celebrity. A reporter who wants to interview a real estate agent in your area is more likely to call you if you have a blog which discusses the latest news. A conference organizer looking for speakers is more likely to find you if you participate online. If there was a site that did video walkthroughs and sold one house per day at a discount it would get a lot of buzz (a website named Woot does this with electronics). If a large enough audience was built eventually the sites could go from being discounted to selling for a premium because they were on website x. If you are new to web marketing it may make sense to participate in vibrant real estate communities like Active Rain, but if you want to make your site a destination that keeps growing year after year you should blog on your own website as well. It is hard to build a lasting personal brand, inbound links, and a lasting competitive advantage if all or most of your social activities occur on another website. But if you offer great content on your own site and many people link at it then you will eventually rank well in the search engines. Many leading social sites like Facebook, Instagram, Twitter & Pinterest have wide reach and offer ad programs which allow you to target local community members. Curbed - Gawker blog about NYC real estate. Also has branches focused on Los Angeles & San Francisco. Future of Real Estate Marketing - Joe Burslem's blog keeping up with the fusion of technology, marketing, & real estate. Get My Homes Value Agent edu - real estate tips and strategies from the people who run Get My Homes Value. Real Estate Tomato - Great blogging tips targeted to real estate professionals. Real Estate Undressed - Larry Cragun covers nationwide real estate news. RealtyBlogging - Group blog from members of the real state community. Trulia Blog - Official blog of Trulia. Zillow Blog - Official blog of Zillow. Homegain Blog - Service which has published thousands of articles offering market data since 1999. Real Estate Radio USA - Blog and radio show about the real estate market. BloodHound Realty's Blog - Blogging group from well known real estate experts. Realty Times - Real estate news network. Transparent Real Estate - Tips on leveraging technology, strategy, and innovative marketing. 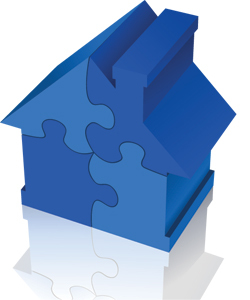 Sellsius Blog - Covers all aspects of real estate, with a focus on marketing and new technology.